Your instep is the top of your foot. It extends from your ankle, down to where your toe joints begin. For some, a traditional short row heel fits fine. But if you have a high instep, there just isn’t enough fabric to fit your heel. It can make your handknit socks hard to pull on over your heel, and make the socks stretch tight across where the instep joins the ankle. 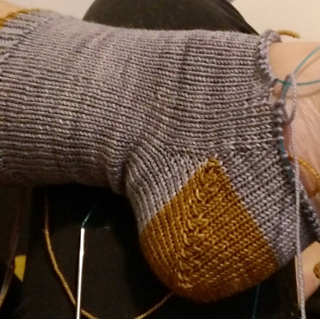 I love the way a short row heel looks (especially when doing a contrasting yarn for the heel), so I started figuring out how to make a short row heel fit over a high instep. As with all bodies, everyone’s feet are different. So we’ll use some measurements and calculations to give you a great fit. Total # of Stitches In Your Sock. These instructions can use any short row method you choose, but my preference is Shadow Wrap Short Rows. If you want to do a contrast heel, I’ve got an instructional video here. It works for cuff down and toe up. You can buy this and the Pocket Heel together in the Heels for High Insteps for a discount. Update 30-May-2017: There is a minor change to the pdf, please check out the errata (lower on the page) or redownload. The pdfs have been updated.